Pro-120, VTX and NCC series controllers. The expansion connector system has changed a few times, which can cause confusion. The changes affect mainly the model loco enthusiasts who use the system for double-heading. With the older system it was necessary to re-configure the expansion connector when going back to two independent locos. Sorry, but we can no longer support these older controllers. The change does not affect use with tacho feedback – though this page has been re-laid to slightly clarify this. The drawings on this page are on the Mark 1 controller (late issues) – however, the positioning of components in this area has changed little so they also apply to Mark 2 controllers. It is not a good idea to mix Mark 1 controllers with Mark 2 (either Pro-120or NCC) as the circuit changed. The responses are slightly different and a mix will not work correctly. However – it should be OK to mix a Mk2 NCC with a VTX controller. 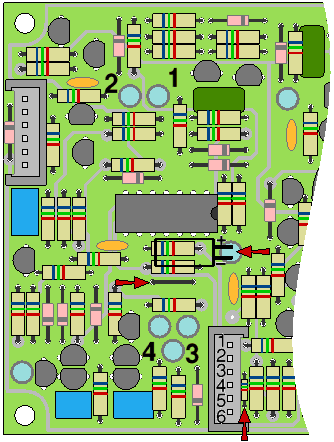 The diagram shows a tacho board fitted in the Pro-120 expansion connector. The expansion connector may by retro-fitted simply to Pro-120 controllers, Mark 1 of issue 9 or later, and Mark 2. Do not try fitting the tacho feedback board to issues earlier than issue 9 as the expansion connector was changed at that point to suit the tacho board. On earlier boards, gently drill out, or better, melt with a hot wire, the varnish which will be blocking the holes. Later board are green resist coated and the holes will not be blocked. For tacho feedback use only, scratch through the link that joins pins 5 and 6. This should not be altered for double-heading. This scratch-through link is on the solder side (opposite side to the components and joins together pins 5 and 6. Whenever an expansion connector is fitted and not in use, these pins must be re-linked by plugging a removable link onto the connector. Solder in the expansion connector as shown. For Double heading, disable High Pot Lock Out (HPLO) – see manual for details. If this is not done, then the slave controller (which has no pot) will be ‘locked out’ – the power relay will not engage and will probably cycle on/off/on etc. HPLO on the master can be left engaged: the master operates normally. The circuit diagram of the expansion system is given on the NCC page. The Pro-120 circuit is the same as the VTX and NCC in this area but the pin numbers are different. The drawing shows the expansion connector fitted to the NCC series controllers. Pin 1 has a selectable alternative function: as standard, it feeds +9v to the connector to power the tacho feedback board. The alternative is that it be used to operate the ignition, which is required when, for example, double-heading a locomotive. Fit a pin (or a piece of tinned copper wire) to the feed-through pads, also arrowed in red. Solder both sides of this through-board link. This is the track that feeds the expansion connector and the newly-inserted link (step 2 above). Cut the track so that pin 1 only connects to this feed-through. See drawing below – Solder Side. Remove the 47µF capacitor indicated above. It interferes with the tacho board. Fit a new 47µF capacitor, lying on its side as indicated above. Steps 2 and 3 may not be necessary: the tacho board just fits and touches this capacitor. Cut the track between pins 2 and 3 of the connector. Also arrowed in red on the drawing above (vertical arrow) is a 100K (sub-miniature) resistor which should be fitted. A space for this is exists on issue 20 and after but is absent on issue 18 and 19, where it should be added to the back of the board (soldered between pins 3 and 6). You can see the holes for it just below the red arrow on the drawing below.If you do not fit this resistor, the controller will accelerate to full speed if the tacho board is removed and not linked out. You will probably need to remove the ‘half speed reverse’ feature by removing the header, as described in the instruction manuals, as this feature is usually not appropriate to applications which use the expansion connector. In theory it is possible to add more controllers simply daisy-chaining them together. But the are caveats, so this use of the controllers is unsupported. Maximum speed will be reduced as the loading on the master controller increases. If you find this happening the link between pins 5 and 6 of the expansion connector of the Pro-120 (pins 2 and 3 for the VTX) should be cut on some of the slaves.Be warned that if this link is cut, it must be restored with a header between these pins when not double heading, or (when the controller is used stand alone) it will accelerate to full speed and you will have no control. This page only covers recent controllers. 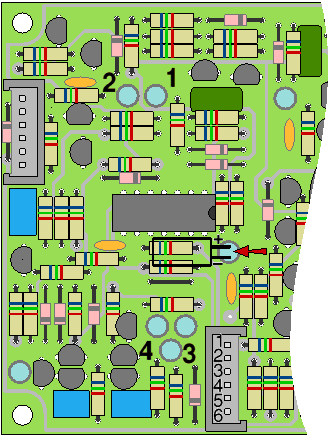 The diagrams in both cases show a late issue Mk 1 board, the Mk 2 is very similar. Pro-120 controllers earlier than Mark 1, issue 9 may accept the tacho board, but an additional 10K resistor is required in series with the tacho board’s output and the fitting is a little different. NCC controllers earlier that issue 20 require rather more major surgery around the expansion connector, so it may be best to trade them in for a later issue, but see the page NCC expansion connector for details of fitting to earlier models. If all is well, the system works fine. In fact, there are so few problems that there are no ‘standard faults’. If there are problems, check a few voltages. Pin functions are as below. Bracketed functions are for information only: do not connect these. Ignition and 9v on the Pro-120 are separate pins. On the VTX pin 1 is used with the board altered to suit use. For double heading, pin 1 is ignition, for tacho use it is 9v1. Ignition is 0v when the controller is running and it will rise to near the battery voltage when switched off. 100mV (Pro-120) or 140mV (VTX) one or other direction relay engages depending on direction. Not that the RAT preset alters this level. 215mV (VTX) controller starts to feed voltage to the motor. MST on Pro-120 adjusts this level. This line is pulled high (9v) when in forward. Selecting Reverse pulls this line down to 0v. With the expansion unplugged, check the voltage betwen the two B- terminals on the controller. This should be essentially zero, but digital meters are sensitive to noise so if you do get a reading, join the two earths with a resistor (1K to 10K) so you can make a meaningful measurement.